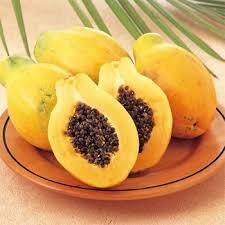 What Are the Health Benefit of Pawpaw Daily? Pawpaw is botanically called carica papaya and its also known to be one of the sweetest fruits or vegetable with numerous health advantages and benefits either to men, women, children , teenagers etc. A common thing about pawpaw and eaten it daily is that it aids easy digestion but not only that, its helps with other health benefit which will be stated as you read on. 1. prevents Cancer: Just like Carrot, Pawpaw also helps to prevent lung cancer, breast and colon cancer due to the beta-carotene it contains. Pawpaw also contains Falcarinol which is very active against cancerous growth in men or women especially when you eat this fruits daily. 2. Vision: Carrot do not help to improve vision but Pawpaw also does. Since its contains beta-carotene, its improve vision and fight against all diseases relating to the eyes. It also contains Vitamin A which clears the vision. 3. Prevents Stroke: According to research, Pawpaw also known as papaya has been known to be very effective for the prevention of stroke especially the unripe pawpaw. Unripe pawpaw is very good to the health and helps prevents the occurrence of stroke when consumed daily. 4. Prevents Diabetes: Some people suffers from diabetes and so they usually don't eat any sweet fruits either it contains gar or not but unripe pawpaw is a good diet/fruit for diabetic patients. It does not add more sugar to the body and with time, it drops the sugar contents in the body. 5. Aids Digestion: One of the benefit of eating pawpaw daily is that it contains high fiber contents which helps to ease digestions. It fastens the metabolic processes after eating or before and helps to secrete digestive enzymes which aids digestion process. You will only experience regular and normal passage of waste with ease when you visit the toilet. 6. Weight Loss: Any fruits that contains fiber really helps to shed some weight that is, they help to reduce excess fat in the body. Instead eating too much carbohydrate or junks, i think is better to do the body more good than harm by eating pawpaw just to maintain the body weight and increase body metabolism. 7. Healing Power: Pawpaw is used in the olden days to treat wounds or healing but i notice pawpaw contains substances like Papains and chymopapians which is a substance that heals any cut, wounds or burns on the skin within the shortest period without scars.Eating pawpaw will boost your skin immune system and smooth-ens the skin in case of any wound or other skin problems. 8. Diseases: Another benefit of pawpaw when eaten daily is that it contains substances like help prevents heart diseases like stroke, hypertension, high blood pressure, cardiac arrest and many more especially for older people as well as young people due to its numerous health advantages. These are the health benefit of pawpaw or health benefits you get when you eat pawpaw. All fruits are good for the body because of the vitamins and minerals they contains but pawpaw is better because it contains all that and fibers as well. Thanks for reading.